Bolts' 145-pounder Carl Harris turned heads by qualifying for the district semifinals, and more from Friday's action. 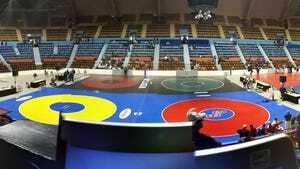 HERSHEY - After an independent doctor controversially chose to send Littlestown 145-pounder Carl Harris home with a possible concussion, Bolts coach Kerry Ferguson worried about how it would affect Harris' chances at districts. The decision forced Harris to forfeit his final two consolation matches at the sectional meet, the first of which he was leading 5-3, and caused him to place sixth rather than potentially as high as third. Turns out Harris didn't need those extra wins. The freshman took care of Wyomissing's Jakob Naylor in the District 3 Class AA tournament first round on Friday, then Harris upset Northern Lebanon's Steve Herb — who received a first-round bye — in the quarterfinals. He will wrestle top-seeded A.J. Kostyak of Boiling Springs in a semifinal Saturday. Harris scored 23 points in those two matches, including seven in the final 2 minutes, 18 seconds of his victory against Herb. The top five in each weight class advance to next week's regional tournament. Semifinalists are guaranteed to finish no worse than sixth place. All four of Harris' teammates who made the trip to districts kept their seasons going for at least one more day. Matt Guilday (220 pounds) and Connor Geiman (182) are also in good position to qualify for the regional tournament, after following last week's sectional titles with quarterfinal victories. Corbin Brown (126) and Cory Becker (138) also remain alive in the consolation bracket after going 2-1. All nine wrestlers remain alive for Bermudian Springs: The first day of the District 3 Class AA tournament turned out to be a pretty short and successful day for many wrestlers, including six from Bermudian Springs. The format of the 12-wrestler bracket means the two sets of sectional finalists at each weight class receive a first-round bye and can advance to Saturday's semifinals by winning just one match. All six of the Eagles' sectional finalists from a week ago did just that, spending no more than seven minutes on the mat to clinch their semifinal spots. Landon West (106 pounds), Noah Fleshman (170) and Brady Linebaugh (285) pinned their opponents. Jarod Miller (132) and Darren Beall (138) secured major decisions. And Austin Clabaugh (120) won by decision. Three more Eagles wrestlers had longer days, wrestling three matches each, but all of them kept their chances of qualifying for the regional meet alive. Ashton West (145), Lucas Gladfelter (152) and Logan Luckenbaugh (195) each won first-round matchups, each suffered setbacks in the quarterfinals and each rallied by winning consolation matches. They can finish as high as third place in their respective weight classes. Barshinger, two teammates, advance for Eastern York: Eastern York's Conner Barshinger's district tournament didn't last long last season. He wrestled two matches, lost both and went home for the season. This year, he's already extended his season by an extra day and could keep it going even longer. Barshinger went 2-1 in the 160-pound bracket on Friday, and he will face Delone Catholic's Zach Hart in Saturday's consolation semifinals. He beat Hart during last week's sectional tournament. Barshinger added that he lifted more this offseason and has kept himself more focused on wrestling. Two of Barshinger's teammates also kept their seasons going for at least another day. Jahshim Snyder, the team's 182-pounder, also went 2-1 and will wrestle in tomorrow's consolation semifinals, while 170-pounder Dakota Mackley built on the momentum of last week's sectional title to win his quarterfinal match and advance to the semifinals. "People weren’t expecting him to win a section title last week, and he sort of rolled through that and we’re looking for another good tournament this weekend,” Garner said. Delone Catholic, Hanover, Biglerville advance wrestlers: All eight Delone Catholic wrestlers kept their seasons going for another day, with two of them advancing to the semifinals. Brian Shermeyer (152 pounds) and Bryce Perkins (285) both had first-round byes and won quarterfinal matches, putting them each one win away from securing a spot in next week's regional tournament. That path will be a little bit tougher for Andrew Knobloch (106), Ryan Hart (132), Brendan Quinn (145), Zach Hart (160), Brady Repasky (182) and Damian Rodriguez (220), who all won first-round matches, lost quarterfinal matches and won consolation matches to earn spots in the consolation semifinals. They'll each need to win at least two matches on Saturday to extend their seasons for another week. For Hanover, Caleb Garland (126) advanced to the semifinals while Justin Barnes (160) remains in contention in the consolation semifinals. For Biglerville, Scott Cooper (145) and Nate Newberry (152) both advanced to the semifinals for the second straight season. Colton Sentz (182) and Victor Lopez (195) also kept their regional hopes alive in the consolation bracket.